ORLIMAR GOLF: LS1 LADIES COMPLETE SET (GRAPHITE SHAFT DRIVER) with LADIES BAG, PUTTER and HEAD COVERS FOR THE DRIVER AND 3 WOOD; CALLAWAY "X-TOUR' STYLE IRONS! BAM.!!! 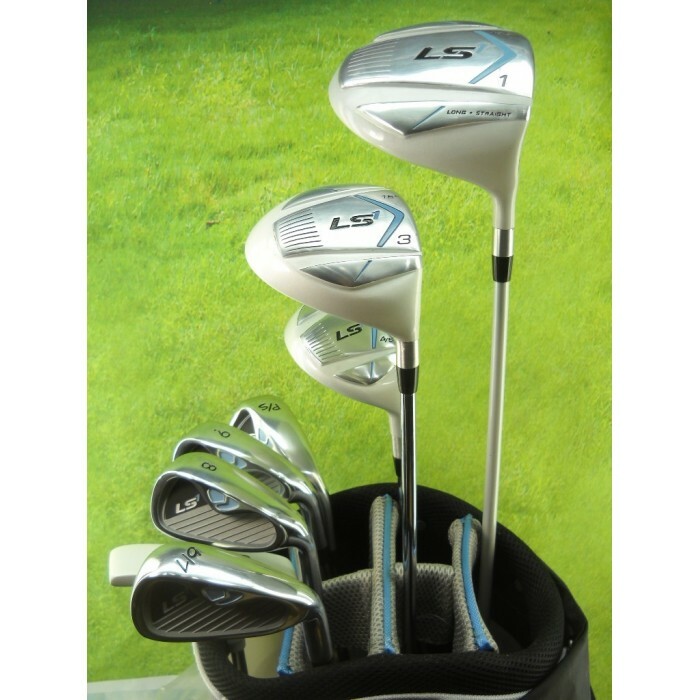 THE SAME COMPANY THAT BRINGS THE ORLIMAR GOLF CLUBS TO THE LPGA PRO'S HAS DESIGNED THE LS1 LADIES EDITION..! "Received item quickly! Thank You very much! My wife loves the clubs! A++ Seller!" This set of golf clubs from ORLIMAR GOLF features A LARGE OVER SIZED 460cc FORGED DRIVER with a 12.5 degree loft to make it easy to get nice height on your drives The Oversize head creates a 30% larger "sweet spot" and up to an extra 30 yards on every drive! The FAIRWAY Wood features the "Low Profile" style of design with a low center of gravity to help you get nice LOFTED shots even off tight fairways and also out of the "rough" !!! The DUAL PERIMETER Weighted SOLE WEIGHTED Cavity Back "OVER SIZED" Irons are Inspired by the Callaway style of design to help square the club up at impact for straighter more accurate shots and more "FORGIVENESS" on those miss-hit shots! The LS1 PUTTER features "heel and toe" balancing and a Precision face with a contoured grip for smoother, straighter precision strokes. COLOR: BLUE, BLACK & LIGHT GRAY (as pictured). Designed and inspired by the latest technology the "LS1 LADIES EDITION" is a great set for the intermediate golfer as well as beginners. The oversize clubs are great confidence builders by providing excellent forgiveness on miss-hit shots. DRIVER; (12.5*) with 460cc OVER SIZED FORGED HEAD for maximum distance and larger "sweet spot"
#4/5 HYBRID Fairway Iron , for those LONG PIN SHOTS and a real "life saves" for those longer fairway shots. 6/7 MID IRON IRON, 8, 9 Irons AND P/S Wedge: (Callaway X-Tour Style) Cavity back and Over sized for maximum forgiveness and accuracy. Matching Grips on all clubs. SORRY GUYS!! These sets were Crafted specifically for LADIES and MEN'S sets are not available!! ORLIMAR and AGXGOLF is headquartered right here in Michigan and they've been around for a long time (even longer than we have)! We've been playing heir Golf Clubs since we were kids and have been nothing but satisfied and we GUARANTEE that you will be too! !